Illinois State graduates scored well on the latest College Scorecard. Congratulations! You’re about to join the proud ranks of Illinois State University alumni, some 190,000+ strong and growing after the December 14 commencement ceremonies. But before you leave campus, the Alumni Association wants to leave you with some quick tips on how to fully take advantage of your newfound status as a Redbird alum. So without further ado and in no particular order, here are the 8 things every new Illinois State grad should know. Illinois State’s Career Center isn’t just for students. The Career Center offers various services to recent Illinois State alumni for up to five years after your graduation date. Career fairs throughout the year are available to all alumni free of charge. And there are several alumni career-services packages available (for a small fee) to provide you with additional job-hunting help. Many employers will ask to see an official transcript before hiring. Since diplomas are processed and sent between 6-8 weeks after graduation, ordering an official transcript is the fastest way to verify the completion of your degree. To order your transcript, visit the Office of the University Registrar. Redbirds at a recent Central Illinois Young Alumni Network event. Were you involved in a bunch of student groups on campus? Then stay involved as an alum too. Illinois State alums have organized a long and growing list of regional and affinity-based alumni networks, such as the Chicago Young Alumni Network and Black Colleagues Association. These alumni groups get together for Redbird Athletics games and watch parties, host special events, and raise money for student scholarships. Insured graduating students who will not be enrolled in classes during the following term may continue coverage for one additional term. Students graduating in December are eligible to purchase spring coverage by applying through My.IllinoisState.edu between December 9 and January 27. For more information on extending student insurance, contact Student Health Services. Do us a favor: Don’t wait until Homecoming 2014 to return to campus. (Homecoming is September 29 to October 5, 2014, by the way.) Come back to visit during the spring semester, and stop at the Alumni Center first to meet the Alumni Relations staff and get the latest info on campus events. Moving back to Chicago? Then swing by Illinois State’s Chicago Office downtown on North Michigan Avenue. Rent a room, host an event, or just use it as a drop-in spot. Plus, it’s got killer views of the city. 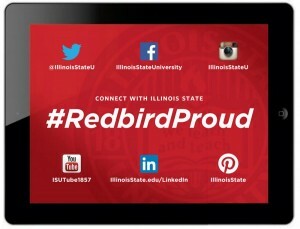 Check out the full list (and find your college or department) on Illinois State’s official Social Media Directory. Good news: As an alum, you’re officially a subscriber to the award-winning quarterly alumni magazine, Illinois State. Next issue comes out in February 2014, but we can’t mail it unless we have your new address. Update your contact information today and we’ll get you on the magazine mailing list.